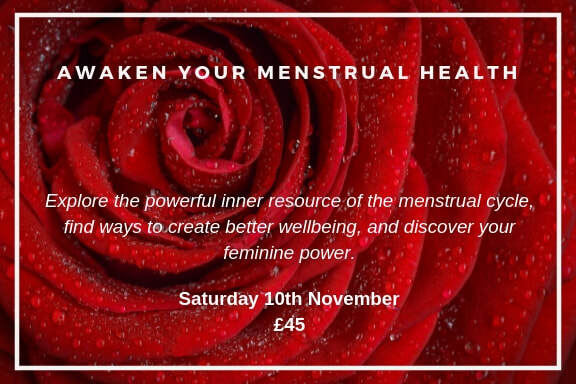 Do you want to explore the powerful inner resource of the menstrual cycle, find ways to create better wellbeing, and discover your feminine power? Menstruation is a map of our physical, emotional and psychological well-being. This workshop offers you the chance to empower yourself with new insights and understanding into your ever changing emotions and physicality to allow you to find your creative power days and to nourish your tender times. We will use shamanic drumming, guided meditation, art and movement to explore the deep relationship with our natural rhythms in a safe and nurturing way in a beautiful and cosy location in Frome, Somerset. suffer from menstrual health problems? want to make peace with your body as a woman? want to gain insights into your natural rhythms for your personal development journey? work with women as a counsellor, coach, psychotherapist or health professional and want to deepen your understanding of the way women's cycles affect their emotional, spiritual and physical health? want to explore women's sacred blood mysteries? We will use shamanic drumming, guided meditation, art and movement to explore the deep relationship with our natural rhythms in a safe and nurturing way at an intimate location in Frome, Somerset. As part of my commitment to supporting women, there will be one free place on this workshop for someone who would otherwise be unable to attend. Please contact me if that's you. A one day workshop for women who would like to explore how to create more wellness in their menstrual and creative cycles.